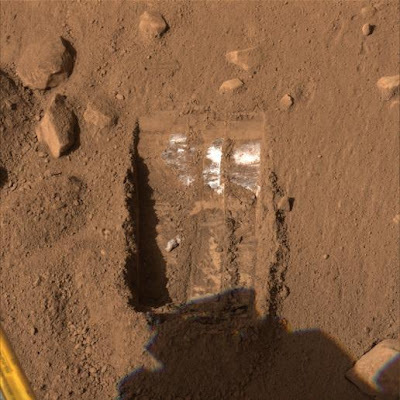 NASA's Phoenix lander has uncovered white stuff under a thin layer of dust on Mars' north pole. But scientists aren't sure what it is, reports CNN. It could be ice. It could be salt. It could be something else (Pound360 is hoping this is the hull of a crashed alien spacecraft, or maybe a ship from Earth's future that slipped into a time warp as it was trying to escape space invaders). Part of the reason Phoenix is exploring the north pole is to find out whether or not microbial live could have developed in the region. And scientists theorize there is a layer of ice beneath the dust that could hold the answer. So it wouldn't be a huge surprise is we're looking at ice (below). If it's salt, this would be evidence of water in the region.